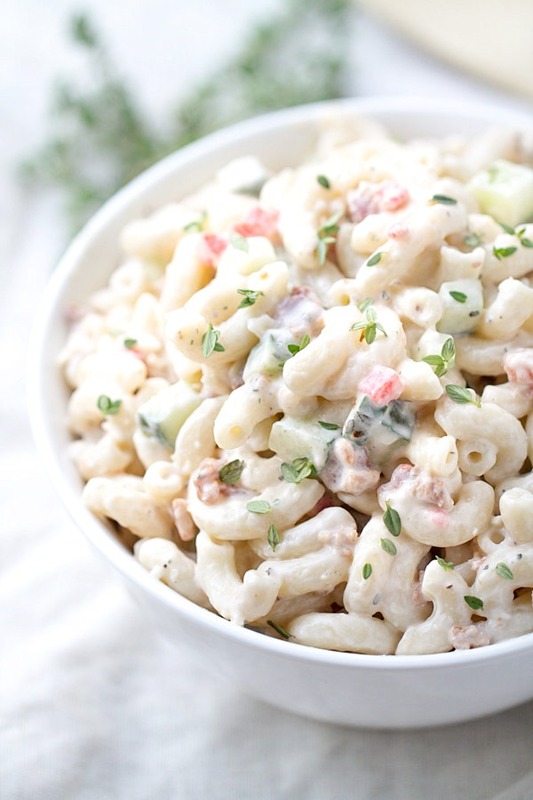 Let’s dig into a bowl of this bacon ranch pasta salad. 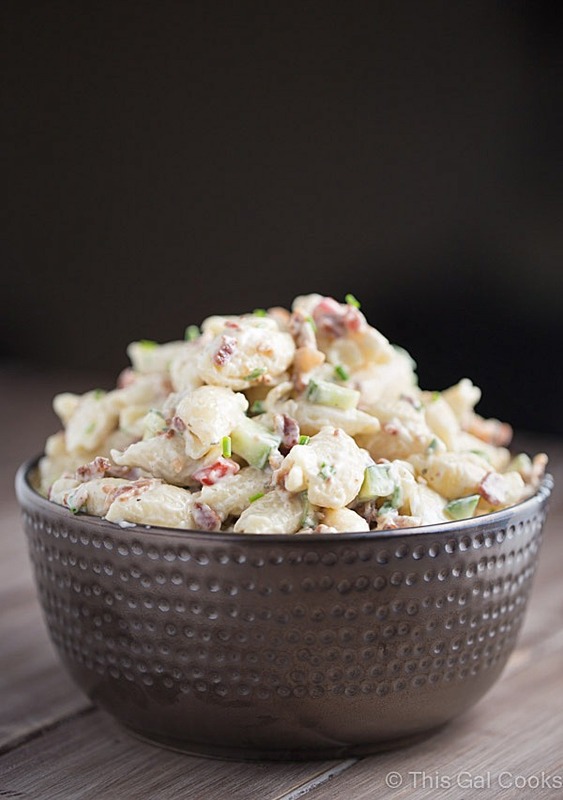 Because what bacon lover can resist a creamy pasta salad filled with BACON? How was Halloween? Unfortunately, we did not get very many trick-or-treaters this year. Friday night Halloween was filled with many events so people chose to go to those events rather than to trick-or-treat. Sad face over here. But we still had fun. We mingled with the neighbors, drank good beer and welcomed the cooler weather that slowly crept in that night. On Saturday, we went to the Jupiter car show and checked out cool classic cars. Then on the way home we picked up some Chinese food. I’ve been craving Chinese food for DAYS so the Chinese food made my Saturday complete. On Sunday I did some baking and made a fudge recipe with some of the GOBS of candy we have left. I’ll be sharing it later this week! So overall, the weekend was fantastic. About pasta salad. I like making pasta salads because they are so simple to make. I’ve made this Grilled Salmon and Vegetable Orzo Salad, this Caprese Chicken Orzo Salad and this Bacon Parmesan Pasta Salad, to name a few. All were hits at my house and I bet they will be hits at your house, too. 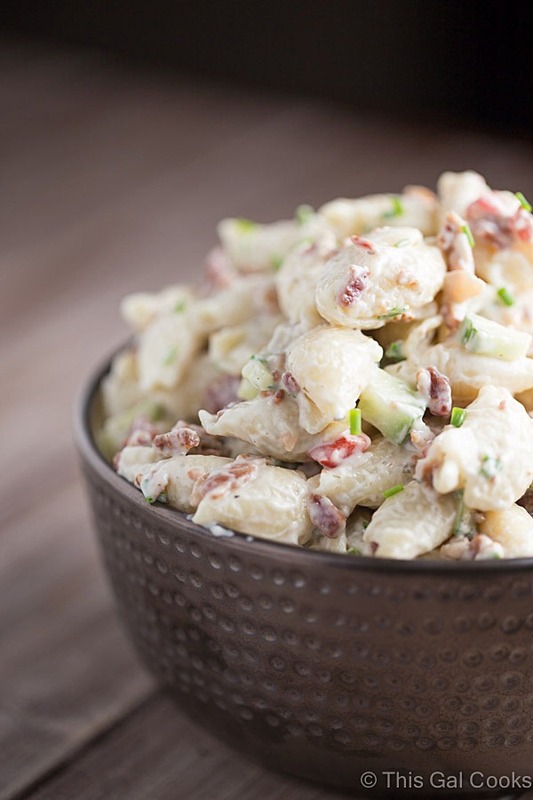 Things to know about this Bacon Ranch Pasta Salad. You can make it with homemade ranch seasoning/dressing. It’s great served alongside a burger or grilled chicken. You can make a meal out of it. You can sub the mayonnaise with Greek yogurt for a tangy, lower calorie option. Cook the pasta according to package directions. Drain and cool. I cool mine quicker by leaving the pasta in my colander and putting some ice in the colander. Once the pasta is cooled, place it in a large mixing bowl with the remaining ingredients. Mix well. Garnish with fresh chives, if desired. To make homemade ranch dressing and seasoning mix, try this ranch seasoning recipe from Gimme Some Oven. Try my Easy Greek Style Pasta Salad. or this Bacon Parmesan Pasta Salad. 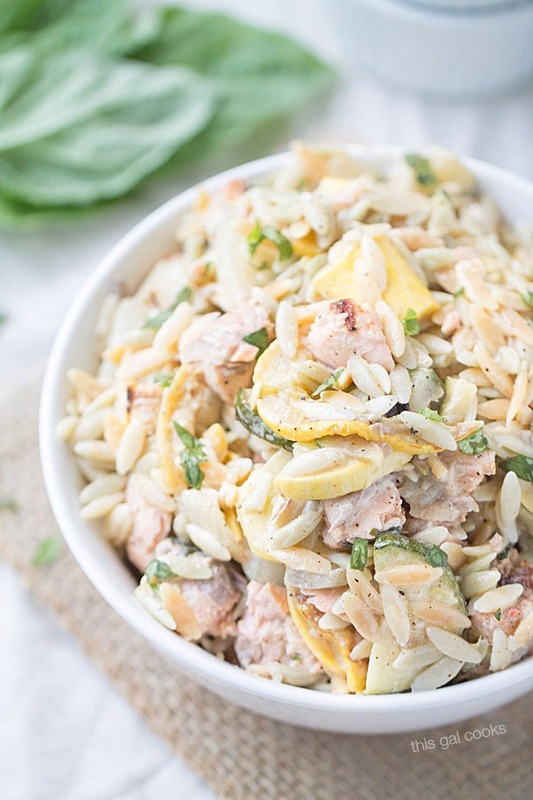 My Grilled Salmon and Vegetable Orzo Salad is a great recipe for using up leftover veggies and seafood! I haven’t been to a Halloween party in ages but I have fond memories of them! Glad you had a good Halloween, Sarah, and thanks for stopping by! Oh my gosh, I’d totally make a meal out of this! Love bacon + ranch, and the chives are a perfect touch! Bacon, ranch, chives. YUM! Thanks for stopping by, Allie! Bacon and ranch everything, please! This looks delicious! We didn’t have many trick-or-treaters either. We only had ONE! And now I have all this candy sitting on my counter, calling my name! Ugh. This pasta salad looks delicious! My kids’ favorite food is anything with ranch so I know the whole family will love it! We have trick or treaters from far and wide in our neighborhood and all I wanted to do was go with my boys. My MEAL would be this pasta salad! It looks scrumptious! Yay! Glad someone got some trick-or-treaters because so many people have been saying they didn’t get any! Thank you for stopping by, Paula! Hope you have a great week! Julie, definitely drooling all over this pasta salad… so divine! Thank you, Gloria! This is totally drool-worthy and inducing, isn’t it? But then again, when is something with bacon not drool-worthy? Thanks for stopping by and I hope you have a great week, too! I think it’s amazing that the introduction of some bacon puts this salad into another league. Very tasty! And quick! And a crowd pleaser to boot. Bacon has a way of doing that, doesn’t it? Thanks for stopping by, Carol! I am a massive pasta salad fan, this is definitely one that I can see making an appearance on my table. Thanks for the great recipe – looks super delicious.. especially with all that creamy sauce and bacon! Our Halloween was great, even though we don’t get any trick-or-treaters here, since we live in the country. We made donuts, drank cider, and watched movies:) Loving this bacon ranch pasta and how creamy it looks! This is a big hit in our family, we use it as a side for just about everything. Glad your family likes this recipe, Lisa! Made this for a work party (doubled it). Everyone LOVED it. I had so many people request the recipe already. Thank you so very much! It was amazing and so easy to make! HI Julie, i like salads since i was a kid, it sounds like a delicious meal anytime of the day, thanks for your recipe at Share It One More Time. Glad you enjoyed the recipe. Thanks for stopping by, Jason! Love bacon ranch anything. This looks tasty! A good side for dinners or lunch. Sure is! Glad you enjoyed this recipe. Thanks for stopping by, Amanda! Sounds delicious! Do you think it could be made the day before? Thanks! Thanks Nicole! Yes, you could make it the day before! 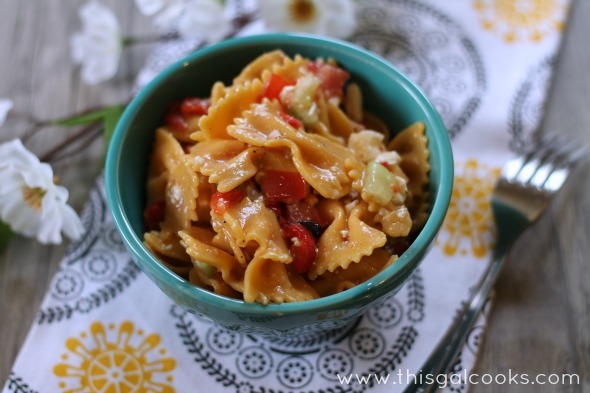 I have made this pasta salad almost a dozen times now and it is always a big hit! One thing I added was a hand full of diced cheese. Cheese, bacon, pasta- yumm! Hi Sara! I’m so happy you enjoyed the recipe. Thank you for stopping by to let me know. Great idea to add cheese, because CHEESE!